When you sign up with PaySource, you will receive a complete payroll package each pay period either electronically or delivery. Inside, you’ll find processed payroll checks and vouchers with essential management reporting. PaySource keeps you in compliance with our HR Support Center fully loaded with employment laws, job descriptions, employee handbooks, trainings and more. Upgrade to HR On-Demand and receive unlimited consulting, custom handbooks, and live chat assistance. PaySource integrates with the very best pay-as-you-go workers' compensation plan providers. With the pay-as-you-go workers' compensation plan, you make payments based on actual payroll volume. There is no more worrying about painful year-end edits or those huge finance charge surprises. PaySource, Inc. is a San Diego based payroll service bureau located in the North County area, serving all of Southern California including the neighboring community of Temecula with our payroll services. Although we pride ourselves as being a local payroll service provider in Southern California, we have the capability to process payrolls and payroll deductions and taxes for companies across the United States. Our personalized payroll services include but are not limited to Direct Deposit, Pay as you go Workers Compensation, Tax Pay and Filing, Online Payroll, Human Resources Payroll Tools, General Ledger downloads for QuickBooks, Employee Background Checks and 401-K Administration. Contact us today to see how PaySource Payroll can save you time and money! Our mission is simple. We want you to completely rely on us to process your payroll and payroll taxes to make your life-and operation of your business easier. Think of us as not only an alliance or partner, but also an extension of your office. The behind the scene back office that confidentially and quietly handles all the headaches that come with payroll. Anything that has to do with processing payroll or taxes; simply toss it over to our in-box and forget about it! We’ll take care of it… professionally, accurately, and timely. It has been our pleasure to work with PaySource since 1998. Since PaySource has been processing payroll for us our organization has grown from approximately 15 employees to over 100, processing over 4.5 million dollars in employee compensation last year. They provide us with personal attention that is shown at every level, from customer service to the timely filing of all payroll tax returns. I have also recommended their services to other Native American Associations who have retained their services and have experienced the same level of professionalism as we have. Kahoots Pet Store has been working with PaySource Inc. since 2006, and are glad we made the change to this company. Lori Catalano and her team show the level of professionalism and commitment for their customers that has exceeded our expectations. We have fourteen stores and are still growing. They have been able to handle all of them without incident. They are willing to make sure they accommodate our business anyway possible: always courteous and friendly when we call them, taking care of our matters promptly. We would definitely recommend this company to any business that is looking for a dependable and reputable payroll establishment to help them run their business successfully. 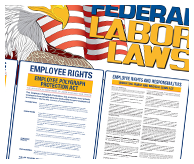 Labor law postings can change at any time of the year, and it is the responsibility of the employer to stay up-to-date. Let us take away the worry and work of keeping your business compliant. Our poster update service will automatically keep you up to date with notifications of changes to the labor law notices affecting you! When a change occurs, we will make sure that your posters remain compliant.